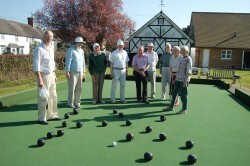 Many of you will have walked or driven past the Village Hall, on Tuesday or Thursday afternoons, and seen some of the members of the Bowls Club totally absorbed in their friendly rivalry and banter, oblivious to the rest of the world, all their trials and tribulations forgotten for a while. If you have, you will undoubtedly have noticed their fine physical condition, athletic bodies honed to perfection by the regular exercise this centuries old sport offers. Don’t be a spectator, let us introduce you to a rewarding and fulfilling pastime, with enormous mental and physical benefits. We realise that some residents, either working or studying during the day, have been unable to take advantage of the excellent facilities the Bowls Club offers, and so in order to rectify this the Club will open on Wednesday evenings from April 6th, weather permitting. There is a misconception that bowls is a sport solely for the elderly, this is clearly nonsense, our youngest member is only 66, so whatever your age, please come and join us. We have the green, we have the bowls and we will provide friendly tuition, all you will need is a pair of flat soled shoes unless you are prepared to play in socks. We are planning to open at 6pm and dedicate the first hour to the younger generation, minimum 10 years old to and including 14 years old, with adults playing from 7pm onwards. Because there are significant costs in maintaining the green, there will be a small charge of £1-00 for juniors and £2-00 for adults per evening.